Two suicide bomb attacks, claimed by Islamic State, killed at least 43 people and injured more than 200 in a Beirut suburb last week. As Lebanon reels from its deadliest bombing in decades, many are hoping a rare show of unity can counter Islamic State efforts to exploit the country’s deep divisions. Last week, twin suicide attacks ripped through a crowded street in Beirut’s southern neighborhood of Burj al-Barajneh, killing at least 43 and injuring more than 200. The blasts, which came a day before the attacks in Paris, were claimed by Islamic State and broke a year-and-a-half of calm in the city. 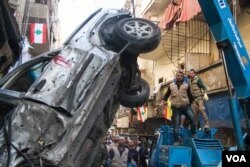 Since the bombings, security forces have made several arrests and seized large quantities of explosives. And many, like Ashan, fear last week's bombings could mark the resumption of attacks that risk escalating internal tensions in a country already riven by religious and sectarian differences. The bombs went off in Burj al-Barajneh, a predominantly Shi'ite suburb of southern Beirut. Divisions among the country’s many political and religious groups — Sunni Muslim, Shia Muslim and Christian among them — have further deepened amid the Syrian crisis. As with last week’s blasts, several bombings until 2014 mostly targeted the neighborhoods of southern Beirut, an area largely under the control of the Shi'ite-backed group Hezbollah. The group’s unilateral involvement in Syria, backing the government against Islamic State as well as moderate rebels, has gained strong support and drawn sharp criticism from within Lebanon. Meanwhile, the country's stability and infrastructure are being further tested by the presence of Syrian refugee numbers that officially total 1.1 million but are thought to be far higher. “These terrorist attacks typically have one aim, which is to pit Lebanese groups against one another to try to deepen divisions,” said Phillip Smyth, researcher and author of the Hizballah Calvacade blog. Success in this ambition could have disastrous consequences for a country whose fissures spawned a brutal 15-year civil war that began in 1975. But as the Lebanese wait to see if there is a resumption of a deadly routine in Beirut, hope is coming from an unexpected source: Lebanon’s ever-squabbling and much-criticized politicians. The inability of the country’s leaders to find consensus has led to a virtually frozen government and the failure to pick a president for a year and a half. But while previous attacks had sparked a blame game typical among Lebanese politicians, this time voices of moderation came to the fore as leaders of parties spoke up in unison to condemn the blast. A crane lifts a car wrecked by one of the bombs. 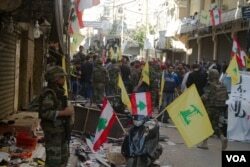 Many in the neighborhood said the attacks would not dampen their support for Hezbollah's military backing of the Syrian government. “Now the situation is in real crisis, the venom and rhetoric is being dropped,” said Bashir Saade, a fellow in politics and international relations at the University of Edinburgh, who said the reaction this time around involved “much less bickering” than before. In a speech last weekend, for example, Hassan Nasrallah, a Hezbollah leader, vowed to press on in Syria, but took pains to try to defuse tensions among communities. Such a thawing in relations may reflect a broader spirit of conciliation among outside countries with an interest and involvement in Lebanon. Saade cited the nuclear rapprochement between the United States and Iran, which backs Hezbollah, as one potential enabler of greater cooperation and gentler rhetoric. But whatever the reasons, in Lebanon, where politicians hold powerful sway over their constituencies, such shifts in tone matter, said Fadia Kiwan, director of the Institute of Political Science at Lebanon’s St. Joseph University. Kiwan said, "There is a new climate among the main protagonists within Lebanon,” and she welcomed the “calls for unity” as a foundation for politicians who have found little else to agree on. Now, with the threat of Islamic State once again all too clear, the pressure is rising for state actors to move beyond rhetoric. Kiwan said the building of a “minimum consensus” in relation to the bombing could pave the way for developing broader consensus on bigger issues, such as the absence of a president and virtually deadlocked parliament — important steps in giving the country the best chance to resist the efforts of those like Islamic State. Meanwhile, back amid the rubble in Burj al-Barajneh, it's clear many are tired of the discourse of division that has so long characterized Lebanese politics.